1156 150 degrees / BAU15S/PY21W. LED Quantity:35SMD. Using bright Samsung 3030 SMD LED, low power consumption, high brightness and energy saving. Uses: Turning lights Reversing lights Signal lights Brake lights Driving lights Taillights. When your purchase, Please make sure it fits your car，OR please leave a message about your car model and year and the VIN number or picture！ [Feature] Condition: 100% brand new Color: As the picture show Material: High quality Aluminum Metal [Fit for] All Cars, motorcycles, bicycles, electric cars [Package]: 4 pcs [Note] .If you have any questions,please contact us ! .Do not open any case before contact us,we will try our best solve your problem and make you 100% satisfaction . .We are highly appreciated your “Positive feedback” and “5 perfect star” ，If you are satisfied with our goods and services .Do not leave any negative or netural feedback before contact us , we will try our best solve your problem and make you 100% satisfaction . SIZE: Thread size: M12 x 1.5/ 12mmx1.5 Nut length: 1.38” (35mm) Nut width: 0.79" (20mm) Key length: 3.5” (90mm) Hex size: 3/4" (19mm) Package: 20pcs chrome conical acorn lug nuts 1 socket keys FITMENT: 60 degree cone seat with 12mmx1.5 thread pitch Please check thread size of your vehicle clearly before purchasing. Any questions, please email us. 2 X T10 501 194 W5W 5630 LED 6SMD Car HID CANBUS Error Free Wedge Light Bulbs. 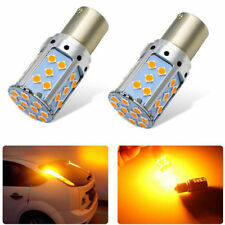 Pair COB H4 C6 Auto Car Headlight Kit Hi/Lo Turbo White Light Bulbs 10800LM 120W. 100x T10 5050 5SMD White LED Light Car Side Wedge Tail Light Lamp Bright. Be compatible with 194,T10, W5W 147 152 158 159 161 168 184 192 193 259 280 285 447 464 555 558 585 655 656 657 1250 1251 1252 2450 2652 2921 2825. Super bright, brighter than normal LED bulbs. 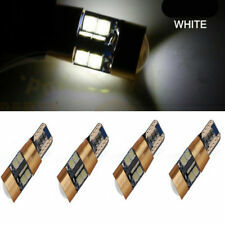 5 LED SMD/SMT. LED Oblong Courtesy Light. 1x LED Oblong Courtesy Light. This LED Stainless Courtesy Light for your camper trailer, marine, boat, caravan, RV applications. It is both suitable for all of your interior and exterior applications as a courtesy light, step light, accent light, or garden light. Compatible: 239,272, C5W, C10W, SV8.5, festoon. 12 ultra-bright patch 4014 LED long-lasting. Type: 4014. Socket Type: 39mm double pointed. Designed directly for the original car light bulb. Light Color: White. Socket: Festoon. Source: cob. Length: 42mm. Long life: service life of 50,000 hours, the traditional light bulb no more than 2000 hours. Energy saving: is the traditional halogen lamp energy consumption 1/5 can better reduce vehicle load circuit;. Type: Parking Ticket Permit Holder Clip Sticker. Stick one on your fridge, a handy note holder. Practical sticker, just stick it to your windscreen. Roomster 2006-2015. Fabia 1999-2015. Octavia 1996-2015. -1x VW Skoda Rear Emblem 80mm (approx). -1x VW Skoda Front Emblem 89mm (approx). Installation: Front Badge, Rear Badge. Superb 2001-2015. 4 x white Car OPEN Reflective Tape. Universal Fits All car models. The color may have different as the difference display, Pls understand. Fits for Citroen C5 C4L C3XR. Car Steering wheel cover. Wheel center cap 4. Car seat covers. Motorcycle parts&accessar​ies. No color shading. Size :5.3 x 6.6 cm. 1 x Limited Edition Logo sticker. You should receive item within 3-5 weeks. There Are No Instructions Included In This Kit. Easy installation, just peel and stick. Self adhesive tape at the back. Suitable for exterior or interior use. 4X T10 W5W SAMSUNG LED COB Silica Gel Car Bulb Wedge Side Light 12V White 192. 80 PCS White T10 Wedge 5-SMD 5050 LED Light bulbs W5W 2825 158 192 168 194 1250. 12pcs T10 Wedge interior High Power 1W LED Light Bulbs Xenon White 192 168 194. Perfect for car body decoration, improve the appearance of your vehicle. Color: Black Silver. 1157 Bases. For Motorcycle LED Tail Light. Turn Signal-48 LED's Yellow. Running Light Turn Signal. Running Light-48 LED's white. Turn Signal Driving Light. Amber Color for Turn Light. The Slot for easy installation. Light Color RGB. High quality SMD 5050 LED strip lights, waterproof, anti-collision, anti-corrosion. LED Quantity 9 for one strip light. LED Type 5050SMD. Remote Keys 24. Remote Battery 1 CR2025 (included). Compatible with 239, 272, C5W, C10W, SV8.5 festoon. Compatible with: 239, 272, C5W, C10W, SV8.5 festoon. LED Type: COB LED. Optional Types: 36mm. Quantity: 10pcs. Super bright white light, giving your car an extra glow. Socket Type: 1156 BA15S. LED Type: Q5. Super bright high power LED bulb. Can be used forReverse Light, Backup Light, Turn Signal Light, Corner Light, Side Marker Light, Stop Light. Parking Light, Tail Light, etc. Waterproof 17cm COB Car LED Lights White 12V for DRL Fog Light Driving lamp. Material:Led panel. We maintain high standards of excellence. Rate (item arrived). Socket: 1157 Bay15d. Compatible with:1157 (BAY15D) 1016 1034 1076 1130 1142 1152 1154 1158 1493 2057 2357 2396 2397 3496 3497 7528 12499 12594. (For Reference Only). Quantity:1PC1 x 1157 64-SMD Lamp. Type: 1210/3528. Package: 2x halo rings lights. Color: white. Color temperature: 6000K. Power: 0.7W each one. LED’s number: 12 each one. Long lasting and high quality. Socket: T10 / T15. SMD Type: 5050. Type: Car LED Bulbs. LED Color: White. Features: Useful, Mini, Easy to Install, Super Bright, Long Lasting, Low Consumption. Each LED Quantity: 5Pcs. 2Pcs x Car LED Bulbs. With this Sticker you are always sporty with your motor vehicle. High quality film for gluing your car or other surfaces when tuning. Installation instructions are included. Warranty : 1 Year. For Bulbs: T10 W5W 147 501. Pre-Wired socket. Could be use to create extra light outlet. Due to light and screen difference, the item's color may be slightly different from the pictures. Wire Color: Red Black. Specification: Color: silver Material: stainless steel quartz Size: Length is 5.5cm, width is 2cm Lamp Type: H1 Voltage: 12V Single light source power: 50W Current: 4.3-4. Suitable for BA15S 1156 socket. Socket Type: BA15S 1156. LED Type: COB. 2pcs x LED Light Bulb. Light Color: Amber Yellow. Due to light and screen difference, the item's color may be slightly different from the pictures.